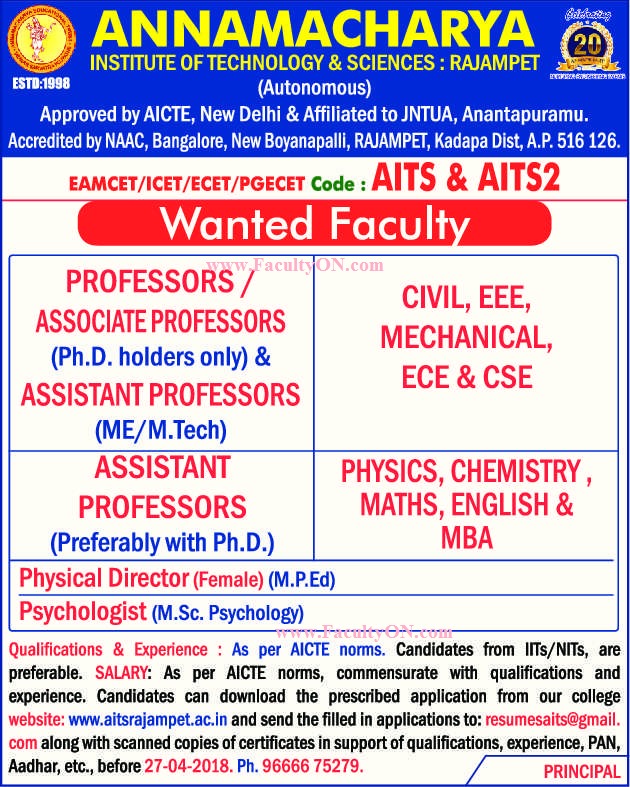 Annamacharya Institute of Technology & Sciences, Rajampet has advertised in THE HINDU newspaper for recruitment of Professor / Associate Professor / Assistant Professor Plus Non-Faculty jobs vacancies. Interested and eligible job aspirants are requested to apply on or before 27th April 2018. Check out further more details below. About College: Annamacharya Institute of Technology & Sciences, Rajampet is an AUTONOMOUS institution and is affiliated to JNTUA, Anantapuramu. The institute was started in the year 1998 under the auspices of Annamacharya Educational Trust in picturesque surrounding on a spacious 30 acre campus near Tallapaka, the birth place of Annamacharya, the renowned saint poet. How to Apply: Interested and eligible candidates are requested to send their application in prescribed format in soft copy along with scanned copies of certificates / PAN card / Aadhaar card and recent PP size photo to the email address provided below.